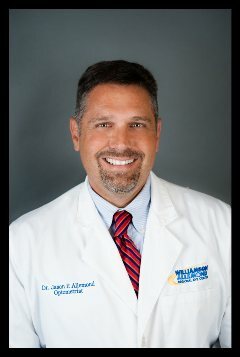 Williamson Allemond Regional Eye Center - Jason P. Allemond, O.D. Dr. Jason P. Allemond earned his Doctor of Optometry degree from the Illinois College of Optometry in Chicago in 1998. He came to Zachary after completing his studies where he provides Comprehensive Eye Care to its residents including managing Ocular Diseases. Dr. Allemond's particular areas of interest include the management and treatment of Dry Eye Syndrome, the fitting of Specialy Contact Lenses, Laser Treatment for the management of Glaucoma, as well as Cataract Surgery post-operative managment including YAG Laser Therapy. Dr. Allemond has an interest in ocular education and clinical research; he has been the lead investigator of 3 clinical research studies. Dr. Allemond's passion is providing the highest quality of eye care to the community he loves.